PARIS — Teenage World Cup winner Kylian Mbappe is giving his bonus to an association that puts sports in the lives of hospitalized children. The head of Premiers de Cordee (First in Line), Sebastien Ruffin, says two weeks before France clinched the World Cup he was informed that Mbappe would give the group his bonus if the team qualified for the quarterfinals. 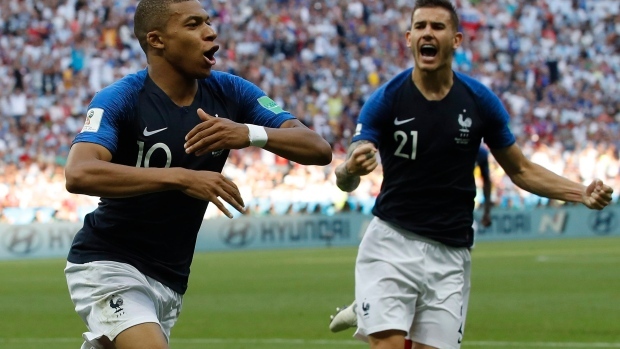 French Football Federation chief Noel Le Graet confirmed in Sunday's Journal du Dimanche that other associations also would benefit from the France forward's largesse — "about 300,000 euros ($350,000)." Mbappe mentors the kids, and Ruffin said the player has "very good contact" with them: "I sometimes feel he gets more pleasure playing with kids than they do."